Interior Features of the Ford Taurus | Richardson Ford Inc. The Ford Taurus's smooth, aerodynamic exterior design carries over into the interior space, where sculpted lines highlight the ergonomic placement of climate and entertainment controls. The interior of this popular full-size sedan offers a soothing respite from the frenetic pace of the outside world. Relax in the comfort of the cabin that uses advanced noise dampening materials to mute the noise of both the engine and the road outside. Seats feature bucket contours and leather trim. Alternately cool or heat both front seats as the weather dictates, while both passenger and driver can adjust climate control from dual settings. The sound system features 12 speakers delivering crystal clear sound using Clear Phase technology. 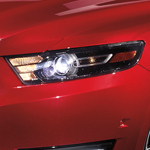 Visit us at Richardson Ford Inc. for a closer look at the Ford Taurus. We can arrange for you to take one out on the road for a test drive to discover its many interior features for yourself.